Samba copy normaly large file, inside router also copy large file. Transmission version from 1.91 to 2.03 - same error. transmisson_error.png​ (464.2 KB) - added by anonymous 7 years ago. Did you try recompile transmission with --enable-largefile option? I cannot confirm this. backfire 10.03.1-rc1/ar71xx, transmission 2.04, disk with ext2 filesystem - debian dvd iso1 - 4.36GB - downloaded without problem. Can anyone give it a try with 10.03.1-rc1 on x86 ? I can confirm that for trunk svn 22705 the problem exists for the x86 build, ar71xx works fine, I tested with a 6GB mkv torrent. I tried the x86 kernel default configuration and my custom pentium 4 /no math emulation/ smp config on a pentium 4 dual core box. The ar7xx box is a tplink 1043-nd. problem exist on my x86 router during all BackFire build begining 10.03-beta, 10.03-rc1, 10.03-rc2, 10.03-rc3 and 10.03 final and remain on 10.03.1-rc1. one problem also - wget - when it get large file then it show progress 100% at 2Gb point, but contiunue get until whole file copied. but wget show 100% at 1902M but continue copy until whole 3874M copied. My guess is that your copy of Transmission was built without largefile support. If so, that's a packaging issue that needs to be addressed by the people who packaged your copy of Transmission. So, search problem somewhere in x86 target. where I can find sizeof(off_t) ?????? It is 8 on OpenWrt. We use large file support which means off_t is uint64_t which equals to eight bytes. may be problem of transmission with large file in uClibc library? Same problem here. 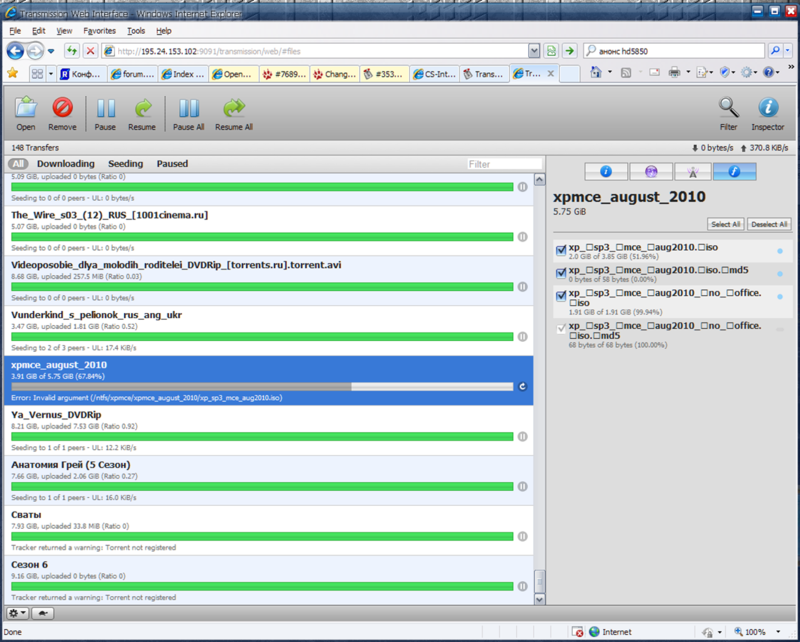 I'm using backfire 10.03.1-rc4 X86. "Invalid argument (inout.c:159)" is what i get when i run the daemon in the foreground and "Value too large for defined data type" in transmission web interface. I hope that i will automatically get the next messages on this ticket. Maybe a solution will appear. since trunk build 24843 my problem gone! backfire 10.03.1-rc4 is build 24045. I don't understand what you are trying to say. The latest Openwrt available is backfire 10.03.1-rc4. That's what it says on the first page of openwrt.org, that's what i see in the download folder of backfire. From where could i get build 24843 for X86? ​http://downloads.openwrt.org/snapshots/trunk/x86/openwrt-x86-generic-combined-ext4.img.gz ...This is the file? Just recompile current version of Backfire. -rc4 is 24045 build, old. I assume this is fixed in RC5.